United States Senator, John McCain, who is battling brain cancer, was in stable condition Monday after undergoing surgery to treat an infection, an aide said, adding that Senate colleagues have made frequent visits to see him. “On Sunday, Senator McCain was admitted to Mayo Clinic in Phoenix, Arizona, and underwent surgery to treat an intestinal infection related to diverticulitis,” spokeswoman Julie Tarallo said. McCain, 81, was diagnosed last year with an aggressive type of cancer, glioblastoma after a brain tumor was discovered by doctors. It has led to a reduced role in Congress for the veteran lawmaker, who was the Republican presidential nominee in 2008 and currently chairs the powerful Senate Armed Services Committee. His wife Cindy McCain took to Twitter to say that her husband was “doing well after his surgery. Looking forward to getting back to Hidden Valley,” the couple’s ranch in Arizona. 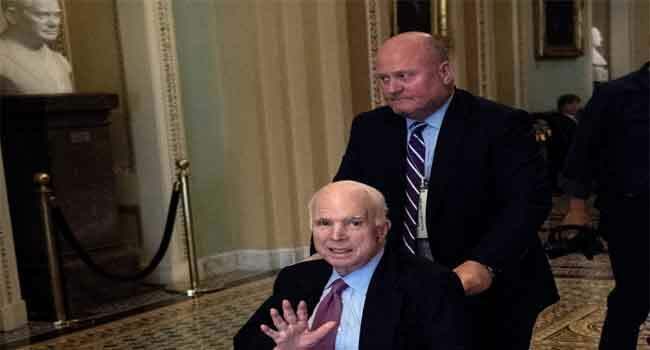 “Over the last few months, Senator McCain has been participating in physical therapy at his home in Cornville, Arizona, as he recovers from the side effects of cancer treatment,” Tarallo said. While McCain has not been seen in Washington for some months, his daughter Meghan expressed optimism in March that her father would be back in the Senate by the summer. Despite being from the same Republican Party, McCain was a major thorn in the side of President Donald Trump during his tumultuous first year in office. The senator effectively sank Trump’s attempts to scrap the health care reforms passed into law during Barack Obama’s presidency by voting against a repeal soon after being diagnosed with cancer. McCain, a former prisoner of war in Vietnam, was first elected to the House of Representatives in 1982 from the southwestern state of Arizona. He has served in the Senate since 1987.